I love to eat out because I am working in my home office all day long, but I don’t like to spend a lot of time traveling to a place to eat so I usually go to a restaurant in Sukhumvit area where it can be reached by sky train or a short taxi ride form my home ( Asoke, Phrom Phong , Thongloe, Ekkamai ). I have seen beautiful pictures and read many positive reviews of Sala Rattanakosin several times. Since this place is quite far from my house, I kept this place at the back of my mind waiting for the right time to pay a visit. Last Saturday I decided to get away from the city center. This riverfront restaurant came to my mind once again and I called to make a reservation. 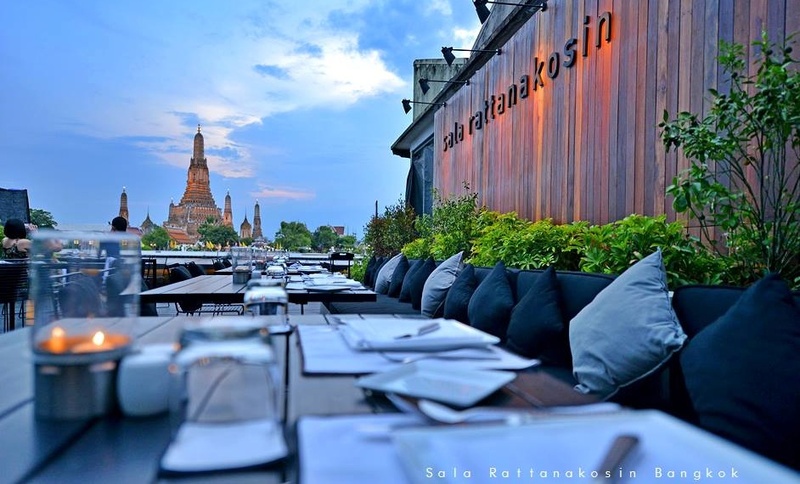 SALA Rattanakosin Restaurant and Bar is in the Sala Rattanakosin hotel, a member of Sala Resorts Group, which was launched in 2013 as a boutique hotel. 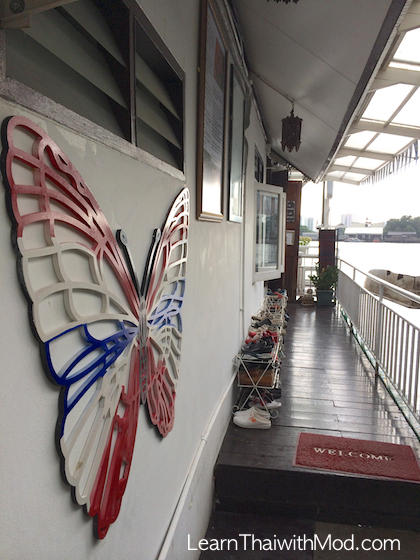 It is located in a small alley on Maharaj road opposite the famous Temple of the Reclining Buddha (Wat Po). 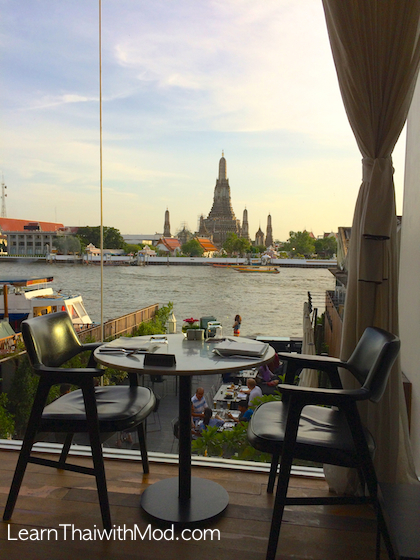 The restaurant’s first WOW factor is of course the view, overlooking the Chao Phraya river and the temple of dawn (Wat Arun). Even for me a Thai, who has been living in Bangkok for more than a decade, it was a breathtaking sight, making a spectacular backdrop for dinner. 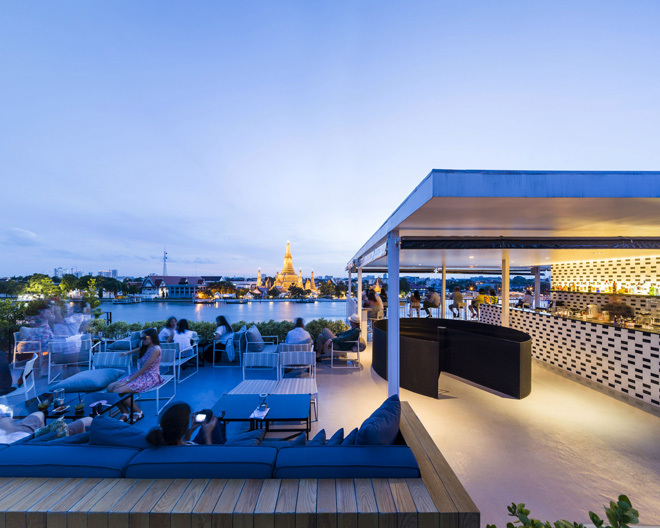 Sala also has a 360 degree rooftop bar on 5th floor (no elevator) offering an unobstructed view to not only Wat Arun, but also Wat Pho and the King’s Palace. 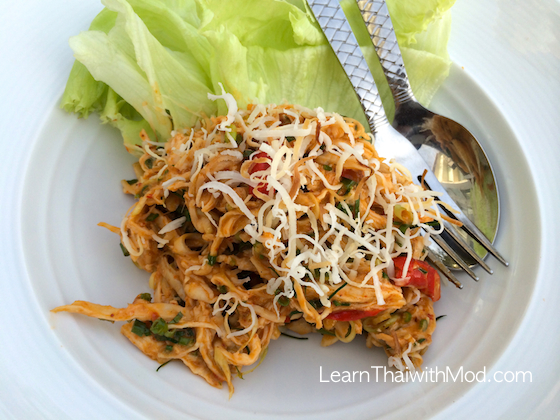 ยำไก่กะทิ YAM GAI GATI (Coconut poached chicken breast with a dressing of lemongrass, mint, coriander, shallots, roast peanuts, chilli & coconut) (250 Baht). This dish came first (even before the rice). I took the first bite right away, I was blown away. It looked like a simple dish, but the taste was so delicate. I highly recommend you to oreder this one. Don’t miss! 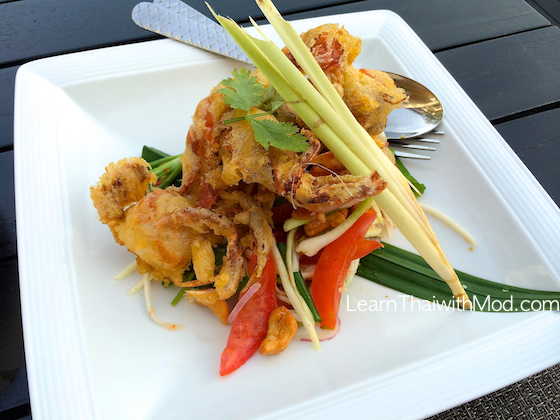 ยำปูนิ่มทอดมะม่วง YAM PUU NIM TOD MAMUANG (tempura soft-shell crab and green mango salad with roasted cashews, Thai herbs, chillies and lime dressing) (290 baht). I never liked soft-shell crabs because it felt like chewing plastic. Until I had this dish here, my view of soft-shell crabs has changed. The chef cooked them so well, I gave this dish 10/10. ต้มยำกุ้ง TOM YUM KUNG The famous hot and sour soup with fresh prawns, galangal, lemongrass and Thai shallots. (280 Baht) The chef was generous with two big prawns. 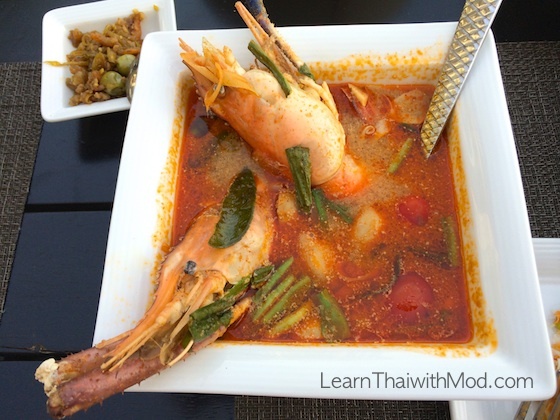 I have eaten a better Tom Yum Kung, but it was still good. The service is also five starts! The staff were very professional and very attentive. Never an empty glass on the table. I would highly recommend this restaurant in Bangkok if you are looking for a exquisite, romantic and gorgeous dining experience with reasonable prices. 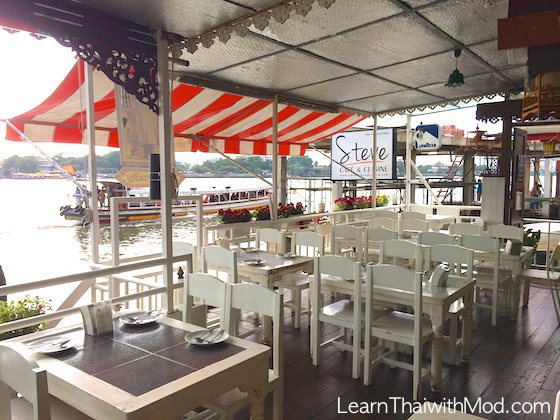 I remembered some time ago I read about a small Thai restaurant tucked away on the riverside, people said they had good food, so I decided to check out the venue called Steve Café & Cuisine. I searched for the location and took a taxi straight from Sukhumvit area. I told the taxi driver to go to Soi Sri Ayutthaya 21, but when we got to soi Sri Ayutthaya 19, we didn’t see the sign of soi 21, but we found Dewaraj Kulchon temple at the end of the street. We went in there and asked a local, and I was told to walk along the narrow path down to the riverside on the side of the temple, interesting location! Once I found the restaurant, my first impression was that customers need to take off their shoes and put them on the shoe racks in front of the door. Just like you are entering a Thai home. Steve Café is a charming private house converted into a restaurant with a medium-size porch by the river and two indoor dining areas that look like a living room. 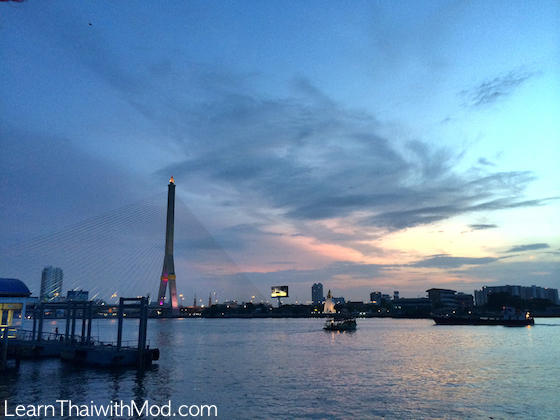 It has a spectacular view of Rama 8 Bridge. I arrived the restaurant at 4 pm so there were only two groups of customers but every table had a ‘reserved’ sign on. I chose to go to a big table with a big sofa on the second row, instead of the last small available table by the river with small wooden chairs. At first, I thought this place was owned by a foreigner or had a foreign chef cooking Thai food since it has English name until I read the story of the owners in the first page of the menu. Steve is the English nickname of the Thai owner who wanted his restaurant to sound international. 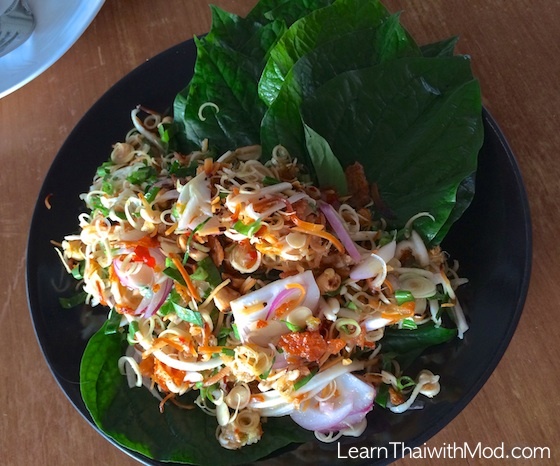 It was too early for dinner, but I was quite hungry so I ordered a lemongrass spicy salad for an appetizer. It was very tasty and refreshing. After finishing my salad and looked around the place, it felt like I came to a friend’s home who has a very good cook. I sat on my sofa overlooking the river, watching the riverboats dropping off their passengers at the Thewet pier close to the restaurant. Thousands of silver fish swimming around, every now and then there was someone at the pier feeding the fish and they all splashing water like they wanted to fly out. Bangkok suddenly seemed so relaxing. 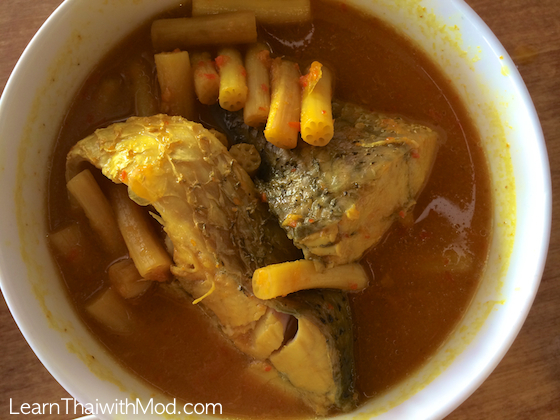 Unfortunately, the steamed fish curry came about 20 minutes after they served the curry, and it was good however not as tasty as the previous dishes. The prices are reasonable for both food and drinks. Over all, I like this place very much. I spent my evening there for three hours. Staff are very friendly and I will go back to try other dishes when I feel like being by the riverside again. 1) Best to visit before the sunset to see both day view and night view. 2) If you want to sit on a porch where you get the best river view, should call in early to make a reservation. 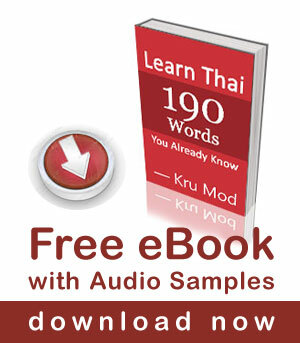 Sawadee khrap, khun mod, khob khun na khrap for your nice lessons. In Bangkok sukumvit soi 11 zanzibar and soi 12 cabbages and condoms is also not bad. I quite liked your frank and honest opinions ! 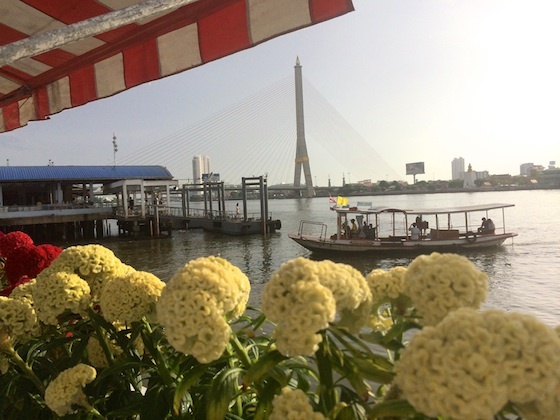 I will be visiting Bangkok shortly, and would like to host a party for about 10 persons at a Riverside restaurant and we’d like to eat Thai food….. Steamed fish (pal), crab, koong, gaai, pork ….. Khaai chiao poo, BBQ Kong, fried rice, tender coconut water Na Maphraew :), tum yum koong, som tam, crispy pork or crispy roast pork belly, pla pao, etc…… It’s my birthday and would like to have a memorable dinner evening ! I shall be happy if you would also join us ! I went through tons of data and am honestly confused ! Everything is so good khrap ! I have earlier been to Asiatique Riverside and also to Khin Lom Chom Sa Phan along the Chao Phraya River. Please Khun Mod, could you recommend a nice place where 10 friends can spend a good time; good Thai food, drinks and ambience …… I prefer the riverside because of the calm and soothing ambience. I recommend you a walk from Saphan Phut / Chakphet Rd , down Maharat Rd to Thammasat University. Many old places renovated, some cafes or restaurant. 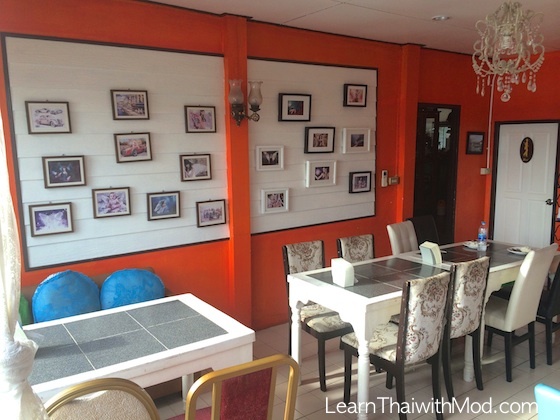 Next to Steve Cafe there is a nice restaurant” In Love” (the other side of the khlong). Bigger, ground floor and roof floor. Beautiful view, especially sunset. It’s easier to find than Steve Cafe (saw from the roof, and Steve looks a bit complicated to get there, but wanna visit Steve Cafe soon) … Thanks for a nice article. Looks nice. will check up the next time i am there! When I visit grung teep, I usually stay with a friend who has an apartment on Sukhumvit Soi 12. Not far, on Soi 14 about 20 meters from Sukhumvit is the restaurant Suda. It’s not fancy but the food it always terrific and it is frequented by local Thai people and farang. I will be in Thailand for the month of August and, if you are interested, I would love to have you join me for dinner there. I have had many great dishes in Thailand, from very cheap to very expensive, but one dish I really loved was the green curry at “Im Chan(g)” on Sukhumvit soi 39. Just below BTS Phrom phong. It’s open air but undercover with the seating on both sides of the alley. 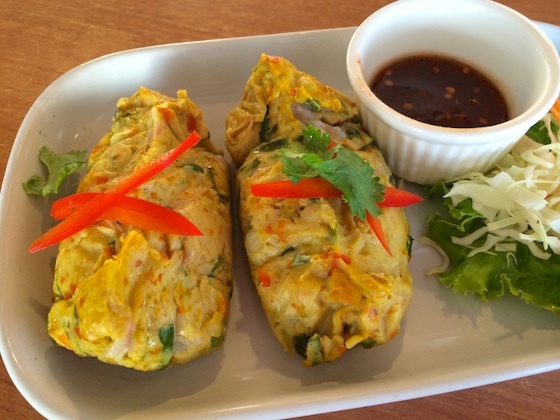 they both sound delicious and the view of Wat Arun adds to the flavour, thank you for this information – I shall try them before I return to the UK. I discovered in sukhumvit 39 a branch of the Rasayana raw food restaurant – the salads are the best I have had so far and very healthy and cheap at 180baht max, they prepare many other dishes to. “”le grand bleu” ko phi-phi,french and thai food,thanks for your address. Very nice report Mod, i hope to get there soon . Lovely report Mod. I hope to visit here next month because of your review. i like your videos so much,hope to see you in bangkok.